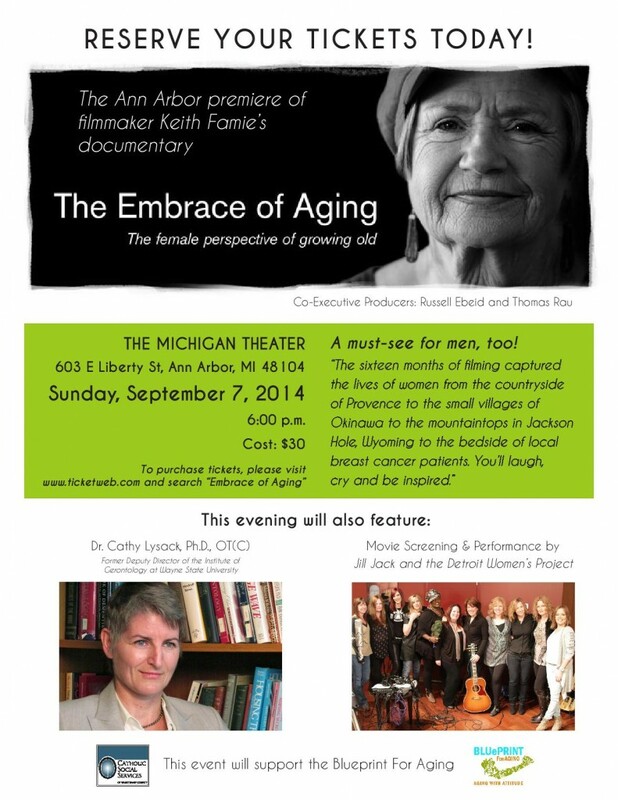 The Blueprint for Aging is thrilled to be presenting the Ann Arbor premiere of The Embrace of Aging: the Female Perspective of Growing Old at 6:00 p.m. Sunday, September 7 at Ann Arbor’s historic Michigan Theater. This one event will touch the hearts and minds of multiple generations and interest groups. The evening will begin with a powerful program that includes film introduction by ten-time Michigan Emmy Award Winning producer Keith Famie, words by Dr. Eva Feldman, MD, Russell N. DeJong Professor of Neurology and Director of the A. Alfred Taubman Medical Research Institute at the University of Michigan Medical School, music by renowned singer-songwriter Jill Jack and the Detroit Women’s Project, followed by the film premiere. To purchase tickets, please visit www.ticketweb.com and search “Embrace of Aging”. For more information about sponsoring the event, please contact Emily Fogelsonger at efogelsonger@csswashtenaw.org or 734-971-9781 ext. 374.